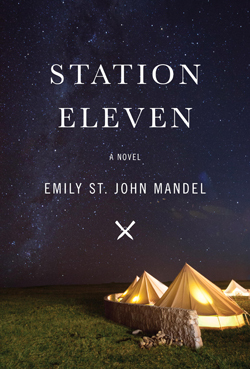 This summer’s vacation read was Station Eleven by Emily St. John Mandel. It also happens to be the 2015 One Book, One Community selection for Waterloo region this year. But it isn’t entirely depressing, as the novel moves back and forth through time, to the days of the epidemic, yes, but also before that, and up to 20 years afterward. It’s like a jigsaw puzzle, figuring out how these characters were connected, finding out the origin of mysterious events in the future timeline. Shakespeare plays a prominent role. The center point of the novel is a Toronto production of King Lear, an unorthodox production featuring children. We learn how the starring actor became famous and get to know his wives. We find that one of the children in the play, a survivor, years later joins a traveling Symphony who bring music and iambic pentameter to the various settlements. Travels that are not without peril. Bonus: This is how Emily St. John Mandel edited Station Eleven. Categories: Arts, Travel | Tags: books, Canadian arts | Permalink.